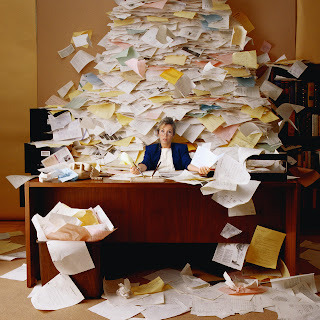 Feeling Overwhelmed With Email? Simplify. This may sound like common sense, but when life gets complicated and you feel overwhelmed, look for ways to simply your life. For weeks, or maybe even longer, I have been struggling to stay abreast of the many demands on my time. Let me see, there is my main gig as the IT Manager for North Carolina Central University, but then there is my role as a father. When neither of those things are in effect, I try to stay abreast of the latest news in technology so that I can write blogs and host various podcasts. Then, as if that wasn't enough, I serve as the Polemarch (President) of my fraternity's local chapter. I'm sure that I can go on listing the number of responsibilities that I have, but this morning it hit me. I HAVE to simply my life. For starters, I noticed that my e-mail account has far too many notifications. Within days, I can accumulate over 1,000 email messages. Just seeing 1,000+ messages causes a knee jerk reaction to avoid looking. That behavior just makes it worse. Avoiding the problem earned me another 1,700 messages. This morning, I recognized that a large part of my messages come from notifications. I get Facebook, Twitter, BlogTalkRadio, Google Voice, Newsletters, Foursquare check-ins, YouTube updates, and much more. Unfortunately, I hardly ever read these notifications. The issue is that what I fail to look in my email box, I risk overlooking something more important. This has happened far too many times lately. Starting today, I am going to turn off those notifications. If I want to know what my friends on Facebook are writing, I'll check-in. In turn, I hope to be more responsive to those messages that are actually important. In closing, let me review. Step one is to turn off all notifications sent to my email account. Step two...I'll figure out step two when I'm done with step one. So, if you're like me then let's begin by removing those notifications. However, let me ask, what should we simplify next?